INDEVA manipulators with INDEVA Gateway are industry 4.0 ready. INDEVA Gateway allows real time output and input data exchange with the Customer IT System through the Company Wi-Fi network and allows visualization of production data by means of an interface software. is a virtual INDEVA® service engineer always at your site for machine data capture and analysis, diagnostic and real time trouble shooting whenever it is needed. 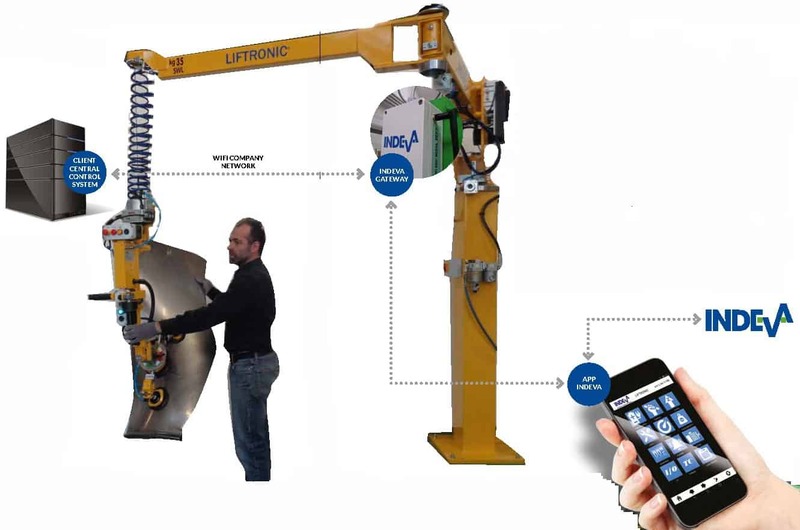 App-Indeva, based on an originally designed App suitable for smartphone or tablet that can be connected via Wi-Fi to the lift assistor, features Real-Time Capability to collect and analyze machine data and to provide the derived insights to operator, maintenance staff or remote Indeva Service Centre.